Our Bringing Light to Rural Communities project, run by our partner, the Anglican Church of Melanesia (ACOM), in the Solomon Islands, is about to enter a new phase. Sale of 200 lighting units to 200 families, benefiting at least 1,000 rural people. Solar maintenance training for communities. Distribution of solar maintenance and consumer rights to 200 households. Awareness raising provided against gender-based violence and discriminatory practices associated with gender norms and roles within the households. Savings clubs, specifically targeting youths and which include financial literacy training formed and implemented across different Dioceses. At least 150 savings groups have been established. These are groups of around 25 people, usually women, who meet weekly to deposit their savings in a group collective. Family homes use the 30 watt solar unit, which the project sells to rural households for AUD$500. The project has also invested in community-owned projects, including the installation of solar in rural training centres and health posts. The project has worked in Guadalcanal, Central, Makira, Malaita and Isabel provinces and is expected to continue to do so. ACOM has facilitated the sale of high quality household solar systems through a network of trained provincial agents. The agents are women from the Mothers’ Union of the local ACOM parish in the province. The project provides the installation team, ensures that young people (between 15 and 25), usually males, train to provide the local maintenance needed. Local Savings Clubs are created to provide finance training to help better manage the family budgets and also support identifying small business opportunities. For example, the household solar units have the capacity to recharge smart phones, and can be used to provide that service for a village as a micro-enterprise. With the Solomon Islands having the third highest incidence of domestic violence in the world, the project also tackles gender-based violence and discriminatory practices associated with gender. The solar units light four rooms in a house and provide an outside security light which is movement-activated. This facility has improved safety around families’ homes. While the details of the new phase of the project are being finalised, we have been working with ACOM to identify an urgent need to provide solar energy to the Fauabu Health Clinic on Malaita Island. 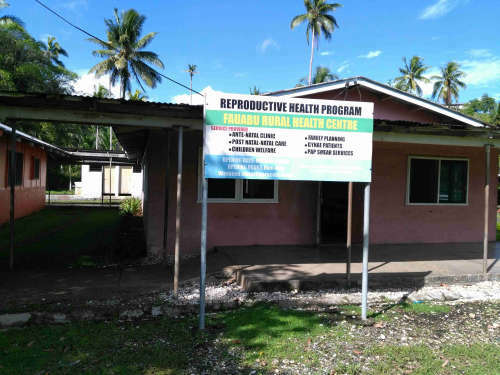 This involves a test of new technology that we hope will be a model for other developments in health clinics and elsewhere in the Solomon Islands. If you would like to know more details of our work with Fauabu Health Clinic, call us on 1800 249 880 or email us.